I have been imprisoned for 40 years! I’m 71 years old and still in a maximum security penitentiary. At my age, I’m not sure I have much time left. When I was indicted the average time served on a life sentence before being given parole was 7 years. So that means I’ve served nearly 6 life sentences and I should have been released on parole a very long time ago. Then there’s mandatory release after serving 30 years. I’m 10 years past that. Now, I’m told I’ll be kept at USP Coleman I until 2017 when they’ll decide if I can go to a medium security facility — or NOT. But, I have been classified as a medium security prisoner now for at least 15 years. BOP regulations say elders shall be kept in a less dangerous facility/environment. But NOT if you’re Leonard Peltier, I guess. If you have not signed this please consider doing so. There is other information on the link that I gave above. You can sign a petition, send emails, but please ask President Obama for Clemency before his leaving the White House. It seems this is the only way to insure that Leonard Peltier would ever be allowed to go home, if he lives that long. I recall how important it was for Herman Wallace to be released from prison even if he only knew it for a few hours and lived only a few days. He at least knew he died a free man, he'd be buried off of the prison grounds. Signed/send off letter, and shared the article all over social media. Your letter will be delivered to the White House. Thank you for your participation. YOUR LETTER WILL BE DELIVERED TO THE WHITE HOUSE. If Peltier dies in prison, the USA will suffer some seriously bad karma. Count on it. Signed other ones in the past, Signed & Tweeted. Thanks, Your letter will be delivered to the White House. Thank you for your participation. Now, please take a minute to call the White House at 1-202-456-1111. Ask President Obama to grant clemency to Leonard Peltier. How sad. I have signed the petition already. Thanks. Every time I click on sending, or calling, I get a blank screen. Reshared article on social media. Noted---and sent the letter to Obama. Thanks Dandelion. Your access to this site has been limited. Reshared article and petition on social media. Sorry C2 members, not sure what is going on. But both the sites, have been up for a long time and I've gone in many times. As both USA and non USA residents are having issues I can't say it's due to people being out of a particular Country. I hope that President Obama pardens Leonard. Letter sent. Maybe there will be justice some day. I think I read this on the Popular Resistance site and previously signed. At that site, it ALSO gives an address to send Letters and Cards directly to Leonard Peltier in prison. I have just now done both those things! Like TomCat, I have been supporting the release of Leonard Peltier since he was arrested! If you read about what happened, before and after he and two others were arrested, you can easily see that there is nothing "normal" about this case. With us sending letters to President Obama, maybe someone will finally release this man. I as well Terre have been fighting for this man's release since the beginning. Breaks my heart. 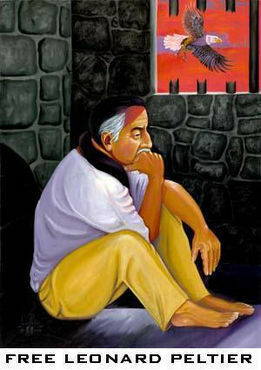 Leonard Peltier is now the ONLY Political Prisoner that Amnesty International has listed for the USA. How tragic it is for an American Indian, the FIRST people that lived upon these lands BEFORE it was called the USA. Reshared article, petition and letter request to President Obama on social media. It is a disgrace that he is still there, please free Leonard Peltier! Change.Org - Executive Clemency for Leonard Peltier. Executive Clemency for Leonard Peltier. Change.Org - Free Leonard Peltier: Contact the President to grant Leonard Peltier Clemency. Free Leonard Peltier: Contact the President to grant Leonard Peltier Clemency. Obama Commutes Sentences of 46 Federal Prisoners, But What About Leonard Peltier? Will you send a letter to President Obama for Leonard Peltier? Free Leonard Peltier: Contact the President to grant Leonard Peltier Clemency..
Reshared petition over social media.